Vacation rental house. Sleeps 5, 2 bedrooms, 2.5 bathrooms. No pets allowed. Unit 17 Lot 2; TOT ID# 1643. 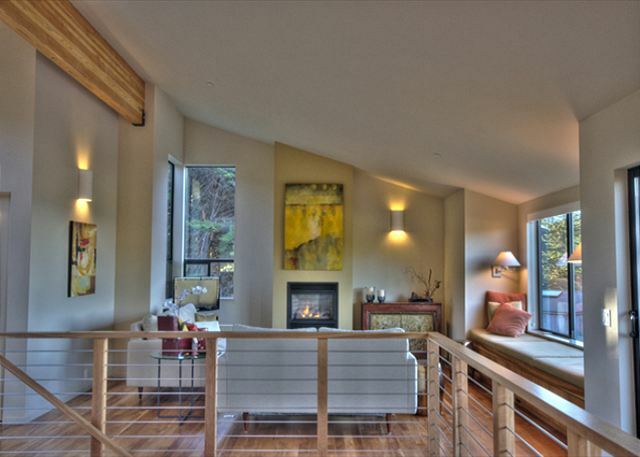 This home was built to allow the light and beauty of Sea Ranch to pour into the rooms; to create a living space where one feels surrounded by nature and it's extraordinary gift to us. The spaciousness, colors, art and architecture of the home were designed to compliment the landscape of forest, meadow and ocean. 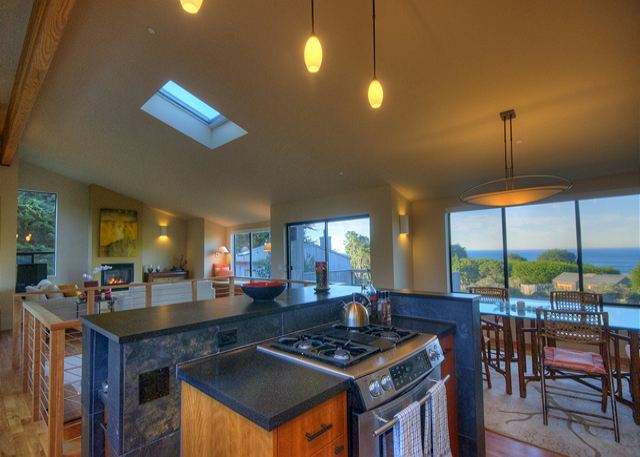 From the minute you walk in the front door you are greeted by spaciousness, light flooding in from upstairs, a sunken japanese rock garden and a large window that extends the eye out to the ocean and the horizon beyond. The home is a place where the outside meets the inside, a place to feel you literally just sitting within nature and its elements. The Japanese motif expressed in shoji screens and furniture brings a simplicity and aesthetic that adds to the sense of calm within. One of our favorite spots in the home is found laying down on the window seat, which affords expansive views of the ocean along with beautiful views of the forest and the deer and birds that are our constant companions. To be so lucky. Due to safety issues, homeowner suggests guests age 12 and older occupy this home rental. 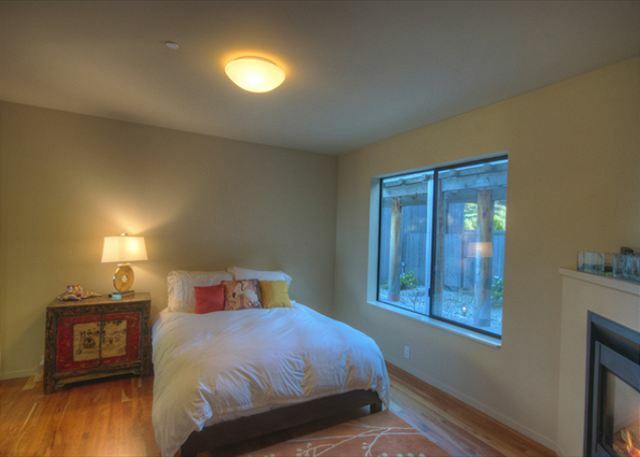 Bed linens and towels are included with this home rental. 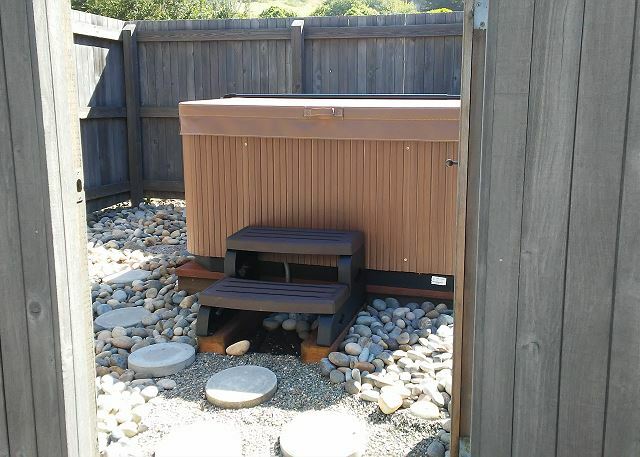 Now featuring a new hot tub as of February 2018 it is up and running! We had a wonderful time in this special home which has lots of charm with special touches throughout. 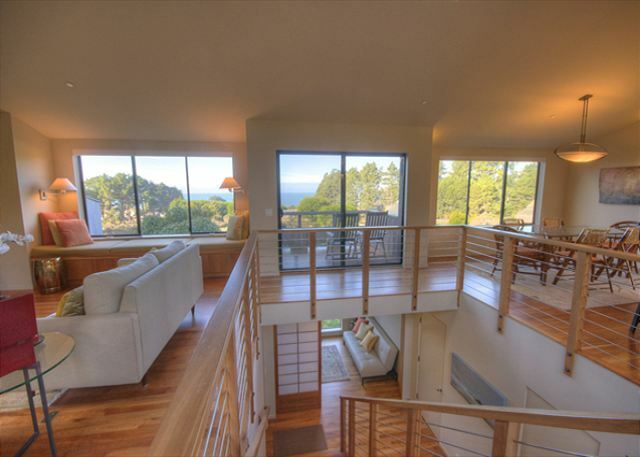 Great views out all windows and great ocean view from upstairs (love the reverse floor plan). Short walk to the beach and lots of options for hiking. It was a cozy place to hang out as a couple. Sipped coffee on the deck, relaxed in the hot tub, cooked some wonderful meals in the kitchen. And Beach Rental staff make it so easy - they are the best! We had a wonderful stay at Sea a Ranch Sanctuary. The house is very comfortable and beautifully decorated. 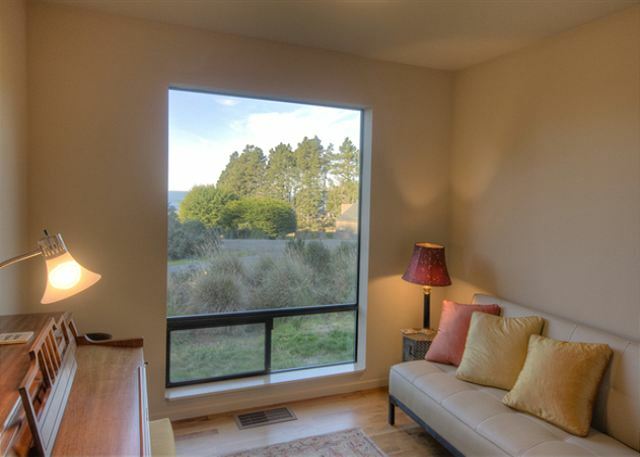 Its proximity to Highway 1 didn’t bother us at all and the ocean view from the upper floor is fabulous. One thing to note is that the house carries and amplifies sound, so it can be a bit loud if you have talkative guests! The management company was excellent. We had a problem with the TV and they sent someone out to fix it right away. House was beautiful and clean. It is within biking/walking distance to rec center so kids can swim. Nice layout and a well stocked kitchen. We loved our stay at Sanctuary. The home is beautifully decorated, with wonderful combination of spaciousness and coziness. We enjoyed the reading nooks, the piano, the views (with and without the telescope on site), the multiple fireplaces and the hot tub, as well as the easy access to walks along the beach. The kitchen is well stocked for cooking. Wonderful experience. Cannot ask for more. House is quiet. Close to jogging trails along the bluffs and plenty of hiking and walking every day. The tennis courts were great to spend time with the family except we had a hard time purchasing tennis balls in town since everyone ran out! One other minor detail. The bedroom doors were Japanese paper thin - would have been great if these were replaced by heavier doors to block "snoring noise". Otherwise, a perfect stay. This house is stylish, comfortable and immaculate. Although it is set back from the ocean, the living room and dining room are on the second floor, with wonderful ocean views. The balcony off the living room is perfect for relaxing. First time at Sea ranch and it left a beautiful impression. The house is very nicely decorated in a Japanese style and fully furnished and stocked. Ocean views from the balcony, sky views from the hot tub. A bit too close to HWY 1 for my taste but it is a common problem anywhere on the shoreline. Very comfortable and welcoming home in a great location. 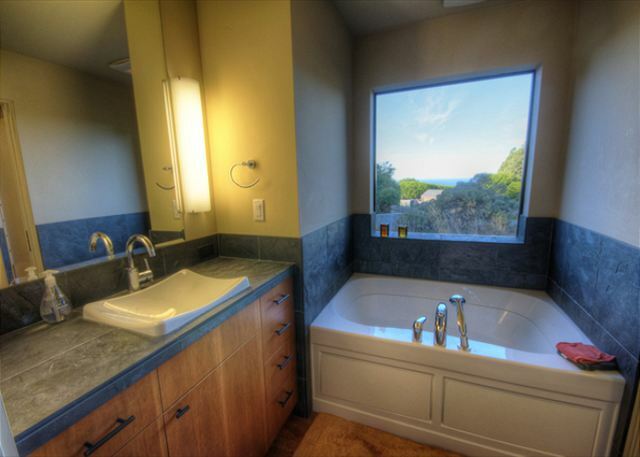 Relaxing and serene environment in the home as well as easy access to the bluff trails and beaches. This house is just gorgeous. 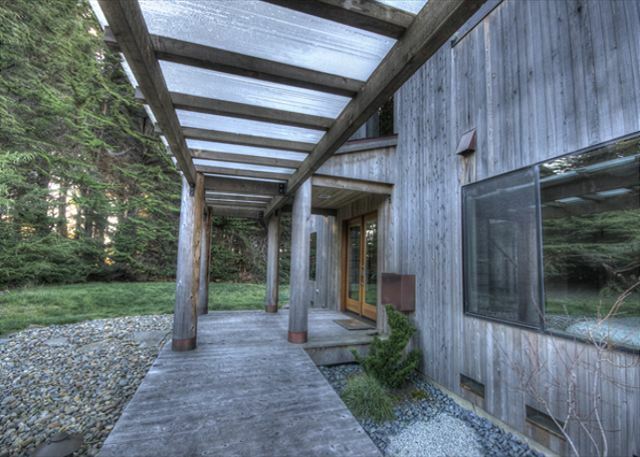 Completely updated and modern, while still comfortable and relaxed, it sets itself apart from other Sea Ranch homes. There was a big storm during my stay and I just loved sitting in the big picture window with a cup of tea and the remote control for the fireplace. The weather was beautiful, but I believe the weather is fabulous whatever it is. 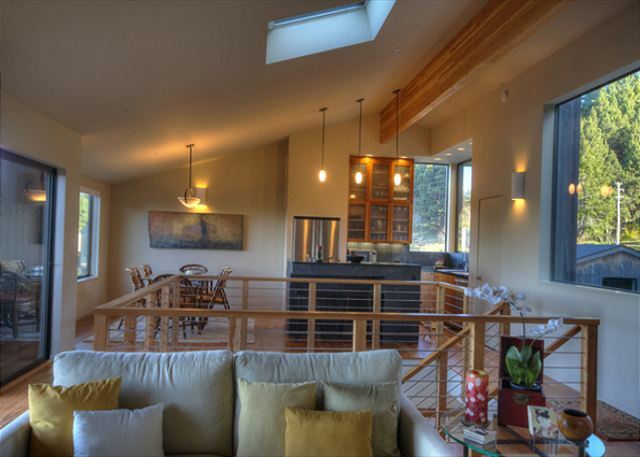 The Sea Ranch Sanctuary was perfect for our holiday getaway! Beautiful views. Gorgeous sunsets. Great open kitchen. Fantastic trails along the stunning coast. Like I said...we loved it! An absolutely beautiful home with a fantastic view of the ocean and close to beaches and walking trails. The house is beautifully appointed and very Zen like...lives up to its name "Serenity" The only suggestion I have would be to have instructions on the use of the grilling feature of the Jennair range. Overall, a beautiful home and great location...making the stay memorable and worthwhile. We spent 5 nights at Sea Ranch Sanctuary. The pictures on the website tell it all. Walk to Pebble Beach, deck with full ocean view, very clean and well maintained. Only negative was no outdoor grill which we sort of understand with the layout having the living area upstairs. We had a great 4 night stay at Sanctuary. 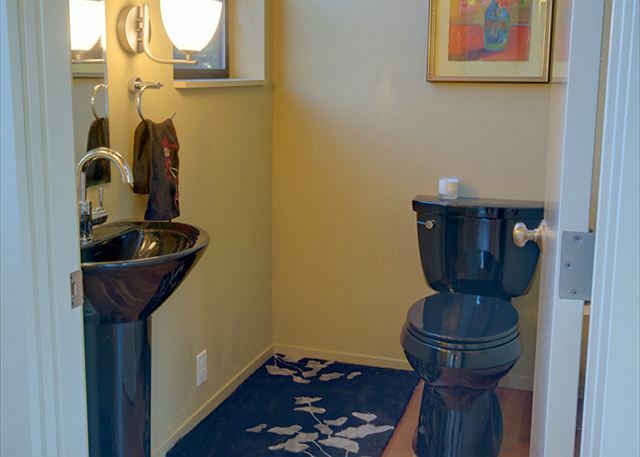 Property was very clean and well maintained. The kitchen was missing a few small items like a whisk and fire starter for lighting candles but everything worked well. The bedrooms are on the first floor and have Japanese screens for doors so noise does travel. The location is great for walking to beaches and getting around but you can see Hwy 1 from the back of the house and hear faint road noise. 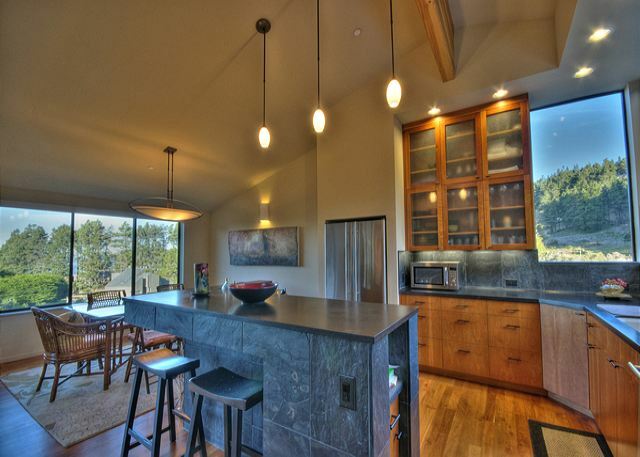 Overall the property is a great place to hang out with awesome views and upscale finishes. I would stay here again. 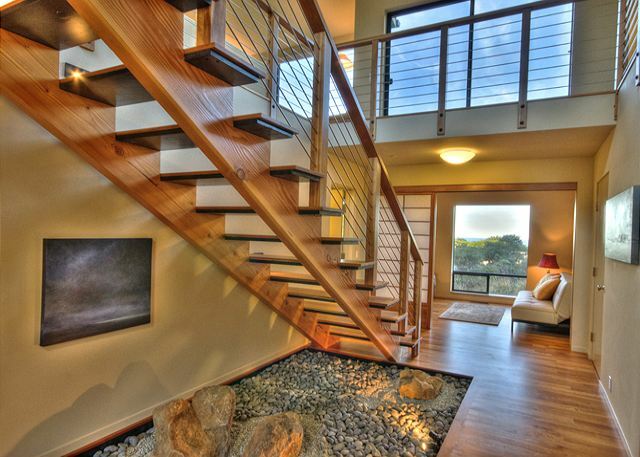 Beautiful home and location - close enough to hear the ocean, walk to the beach and relax watching the sunset. Piano was a great plus as our daughter learned to play Stairway to Heaven ;-). We wanted a relaxing space for a girls getaway and the Sea Ranch Sanctuary exceeded our expectations! We loved walking on the nearby beach, hiking the trails and watching the storms roll in from the comfort of the living. Deer and quail strolled by adding to our joy of being in such a beautiful place. This was a perfect getaway for us. The kitchen is fantastic and the fireplace was perfect for the evenings. Just outside the door are paths to the bluffs, which we took at least twice a day. It doesn't have the privacy or spectacular view of some other units (although you can still see the beauty of the ocean and sunsets from the window seat!) but that is reflected in the affordable price. Well located, super clean property with peek-abo white water views. With totally up to date and comfortable furnishings, it is hard to beat! We really enjoyed the upstairs deck, the three fireplaces (though a little loud during lightoff) and the oversized shower in the second master. Perfect for teen to adult children and couples, we would say that with lots of glass tops, hardwood floors and steps and stainless steel, it probably is not ideal for small children. 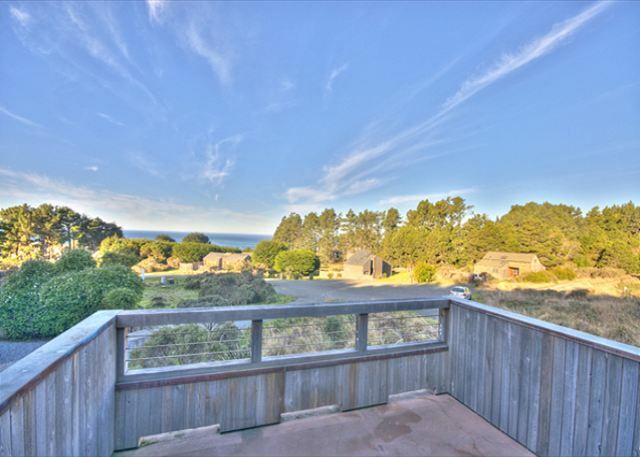 Close to trail entrances and other classic Sea Ranch homes in our favorite part of the development, the south side we would definitely return for another stay. Nice elevated deck for western view of the ocean panorama. A wonderful change for my annual "sabbatical"! An atmosphere of calm and peace in this home, with a wonderful ocean view. Love the window seat for all my reading!!! And having the piano is a bonus! Only challenge was finding a place for groceries for a 3 week stay? My favorite part was being able to walk to the Lodge each morning along the ocean bluff to get a cup of coffee and the morning paper--about 5 miles round trip. Great exercise and changing scenery each day! I brought my sisters mom daughter and granddaughter up for a girls long weekend. I couldn't have been happier or more impressed with our house. We weren't close to ocean but we could see it and the most beautiful sunsets. I would highly recommend this house. The only issue we had was the remotes on the tv. It tool 4 of us and 2 days before we could actually watch a movie. Sunsets and Moonrises....ease and delight....lovely walks and beach cove...comfort and beauty. visit, and always use Beach Rentals! Absolutely a perfect vacation rental. Clean, well furnished, amenities and a magnificent location and view from the upper level. I would most certainly recommend this rental to others without hesitation. A fine place to relax, extremely well appointed and everything worked perfectly. Nice kitchen! This was our first vacation at Sea Ranch and we loved staying at the Sanctuary. The home was exactly as advertised and was spotless upon our arrival. 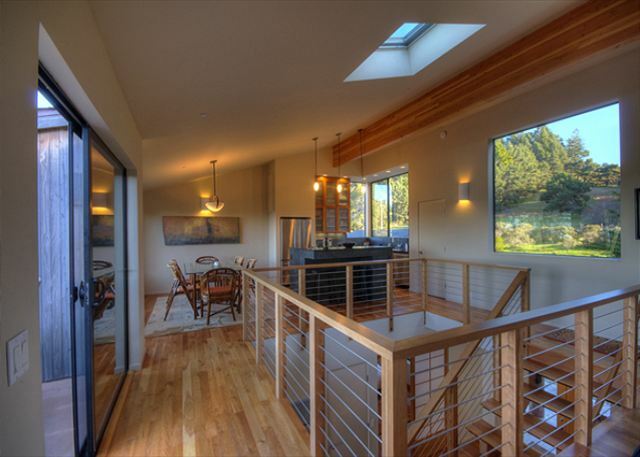 Location is about a 5-minute walk from the ocean bluff trail, with views of the ocean from the 2nd floor. It was intelligently designed to have common areas on the 2nd floor so you can take full advantage of the views during the day. The kitchen was better stocked than I anticipated and allowed for group meals to be easily prepared, the only tool missing is a whisk for making eggs, etc. Otherwise, the kitchen was perfection. We also enjoyed the gas fireplaces - great for ambiance and warming up at the end of the day. The window seat in the living room was a favorite place for naps, reading and games. Be aware the doors to all bedrooms are literally made of paper. They are beautiful but this allows you to hear any and all noises from upstairs from the bedrooms. Just something to consider if you have a group of people with different bedtimes or children that need to go down early. Fantastic place, we would stay again in a heartbeat!!! This is my second stay in this beautiful house. Both times we loved it. It is spotless clean, beautifully and simply decorated and magnificent blue water and tree views.The beds are super comfortable, great bath and shower, fantastic kitchen for cooking and light everywhere. Couldn't be happier with a house. One thing you need to be aware of the left front burner on the stove does not work. This house is really lovely. Everything you may need is available to you in terms of kitchen or bedroom/bath. View, peace and quiet all of those important small things are available in abundance. We had a great retreat from daily life. Every inch of this house is PERFECT! The directions on how to turn on the TV did not work, and the smoke alarm seemed to be a bit sensitive (a burned bagel, really?) but I actually cried when I left (& I live in a really nice house - I still did not want to leave the Sanctuary. It is that awesome.) Oh, and the view from the balcony is much better than the picture. I can't wait to go back! For the price, this place is top notch. Despite being so close to Hwy 1, this house was so quiet and I never heard a car while staying there. The floor plan is smart, bedrooms downstairs, kitchen and living areas are upstairs. As a result, the views are great. 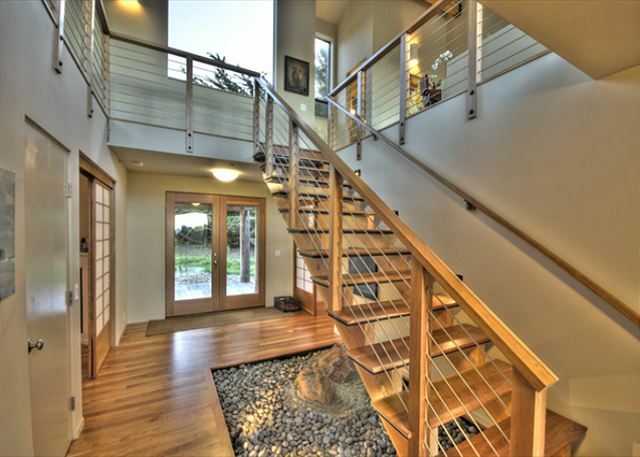 The Japanese theme is tastefully done, and the house is very clean and modern. I do wonder what it would be like to stay here with another couple, the shoji doors are very thin, but I never even touched them while I was there. This place is absolutely perfect for two people. Everything was perfect. My only minor complaint was that the refrigerator was a bit noisy, so we had to play with the positioning, in order to keep it quiet. I generally like to stay at different places, each time I visit Sea Ranch, but I will be very tempted to stay here again. Our stay was a relaxing respite. We are looking forward to coming back. This was a beautiful place at a reasonable price. It was in excellent condition and clean, had great amenities, and good location (although a little close to the highway you can't hear it). My only complaint about the process is that you have to drive up to Gualala to pick up the key. After a 2+ hour drivey ou just want to be there. It would be easier to just leave the key in a lock box on the property. I would stay here again. It was beautifully decorated and comfortable to relax in. A beautiful home...like one might see in a magazine. Wonderfully decorated yet comfortable...even indulgent. Privacy might be an issue for some but if you're traveling with family and/or close friends, it's a wonderful place to be together. A little surprised by the fees and extra cost for linens if you do not want to pack your own. And you might want to bring some water glasses for drinking...only beer and wine glasses provided. Nice quiet and relaxing place to stay, which is surprising since so closed to the freeway. Perfect place to bring books that you wanted to read but didn’t have chance to. Just right easy walking distance to the beach. I wish windows at downstairs are tinted a little, so don’t see through rooms especially in the bathroom. I also wish to have one more set of dishes and glasses. We stayed with 4 adults and cooked most of the meals in the house, we needed to run the dishwasher every day. I’d like to stay again. Wonderful home, terrific location (close to bluff walk and Moonraker pool), comfortable floor plan, well-equipped kitchen, and easy, aesthetic sensibility. I spent many happy hours in the cozy window seat. It was a lovely retreat. Serene, elegant Japanese-infused-style home that allowed us the chance to reconnect and rekindle. Strongly recommended. Really a wonderful place, would definitely stay there again.